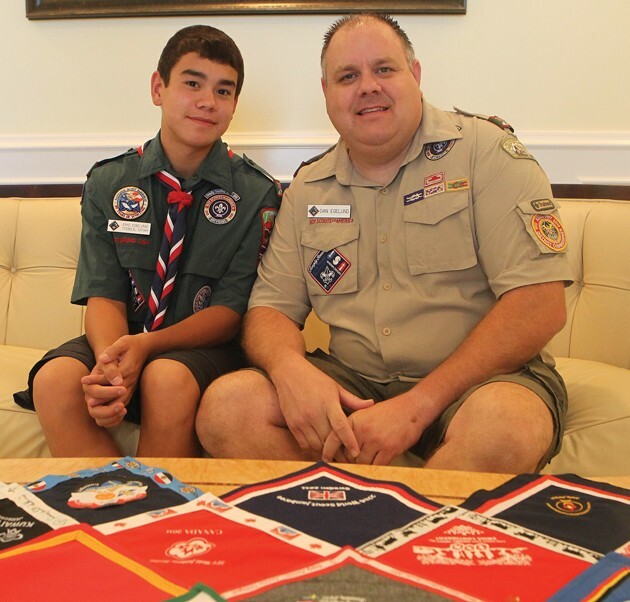 Eric and Dan Egelund sit at their home with the neckerchiefs that they picked up from different country’s scouts at the International Scouting Jamboree in Sweden in September 2011. Egelund served on the International Service Team for the 22nd World Jamboree in Sweden. Egelund will serve as the Scoutmaster for the Great Salt Lake Council’s 2019 World Jamboree Troop. 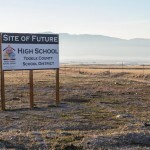 For the first time in 52 years the World Scout Jamboree will be held in the United States, and three Tooele County Scouters have been selected to organize and lead a troop of Scouts to this event that takes place once every four years. The 24th World Scout Jamboree will be held July 22 to Aug. 2, 2019 at the Summit Bechtel Reserve in West Virginia. It is anticipated that nearly 50,000 Scouts and their leaders from around the world, along with a volunteer staff known as the International Service Team, will meet and camp together under the banner of the World Organization of the Scouting Movement. The nearly 50,000 attendees will represent their respective national Scout organizations and will come from over 160 countries to be part of this special event. With this many countries being represented, the Boy Scouts of America is limited on how many of its members are able to attend. 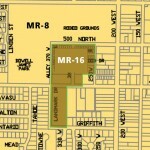 It is anticipated that a single troop of 36 youth and four adults will represent the Great Salt Lake Council, which is comprised of Salt Lake, Summit, Tooele and parts of Davis counties. “It’s a real honor to be selected as a World Jamboree Scoutmaster,” said Dan Egelund, Tooele. “It’s been a goal of mine for a number of years now, and to actually be selected is gratifying.” The other leaders for the Great Salt Lake Council world jamboree troop are: Blair Hope, Tooele; Tim Pruess, Salt Lake City; and Eric Egelund, Tooele. Eric Egelund, son of Dan Egelund, is serving a mission for The Church of Jesus of Latter-day Saints in Vietnam. He will return this summer in time to begin preparations to serve as the Junior Assistant Scoutmaster for the jamboree troop. “Between the four of us, we have plenty of jamboree experience,” said Egelund. Combined together, the four leaders have attended 14 national and world jamborees, according to Egelund. World jamborees are held every four years in different parts of the world. National Scout organizations put together a proposal, and similar to the Olympics, bid in order to be able to host a world jamboree. The 2019 World Jamboree is a unique jamboree in that the bid was submitted and awarded as part of a joint effort between Boy Scouts of America, Scouts Canada and Scouts Mexico for what is being promoted as the North American hosted World Jamboree. Recent previous world jamborees were held in Japan in 2015, Sweden in 2011, and England in 2007. In 2023 the 25th World Jamboree will be held in South Korea. For local Scouts, West Virginia may not be an exotic location, but with the jamboree relatively nearby it will make the experience more affordable and more accessible for Scouts who otherwise may not be able to participate. The Summit Bechtel Reserve is a facility wholly owned, developed and operated by the National Council of the Boy Scouts of America. It features a wide range of activities from climbing, mountain biking, fishing, climbing, archery, rifle and shotgun shooting, ziplines, canopy tours and more. In addition to the adventure element that the jamboree activities provide, the participants at this jamboree will also focus on friendship, sustainability, service and leadership, as the other elements of the jamboree program. While at the jamboree, Scouts will camp together with their own troop in a campsite that will be nestled amongst campsites of Scouts from around the world. Camping with Scouts from Germany on one side, and Scouts from Egypt on the other side, and across the path from Scouts from Chile and Indonesia, in a hypothetical arrangement. Scouts have a great opportunity to easily create international friendships that can last well beyond the jamboree. It is common for Scouts from neighboring camps to prepare traditional meals to share with each other and have cultural exchanges by sharing music, traditions, and even swapping uniforms and attire. There are many similarities between a World Scout Jamboree and an Olympics, and fortunately a Scout doesn’t have to put countless hours into training and preparation in the hopes of being selected for the troop, like an Olympic athlete. An interested Scout will need to be at least 14 years old before July 22, 2019, but cannot be 18 before Aug. 2, 2019. All local jamboree Scouts will need to be registered with the Boy Scouts of America through the Great Salt Lake Council. They need to be in good standing, willing to pay the required participation fee and agree to the standards of conduct while at the jamboree. If there are any young girls that would like to participate in this world jamboree and meet the same aforementioned age guidelines, they are encouraged to register to participate as a member of a co-ed Venturing crew that is being formed and be comprised of youth primarily from Utah.